Duke and Billy, two popular and renowned New York City Police detectives, are hot on the trail of a dangerous Japanese crime syndicate. Their investigation has led them to the mean streets of Japan where they meet a police officer and martial arts expert named Ryu. Ryu agrees to join the NYPD detectives as they track down the crime syndicate bosses and end their reign of terror once and for all. 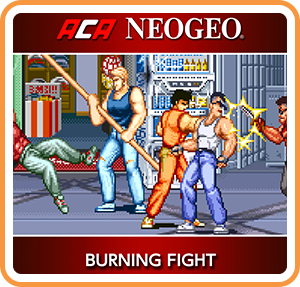 Where can I buy ACA NEOGEO BURNING FIGHT physical/digital?